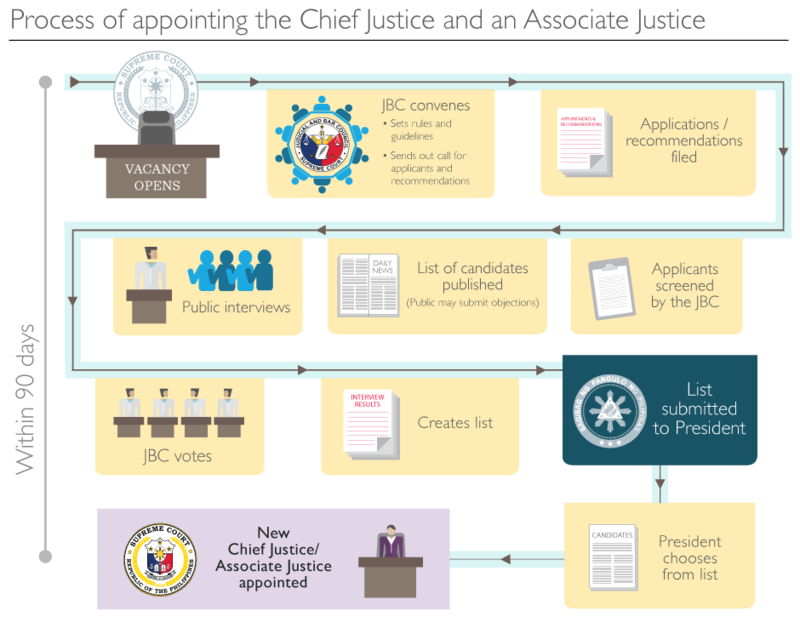 The Judicial and Bar Council’s (JBC) primary task is to recommend appointees to the Judiciary and the Office of the Ombudsman for the President’s perusal. The council aims to enhance the quality of the search, screening, and selection process, as well as insulate the process from undue influence of any kind. The 1899 Constitution, which established the First Philippine Republic, was the first instance of Philippine law providing for the creation of a Supreme Court of Justice (Supreme Court) and the appointment of a President of the Supreme Court (Chief Justice). Title X, Article 80 mandates the National Assembly, a legislative body, to be the appointing authority of the President of the Supreme Court. This appointment, however, would need the concurrence of the President of the Republic and his secretaries. This was the only break in an otherwise consistent history of a President being the appointing authority. From 1902 to 1935, it was the prerogative of the President of the United States to appoint the Chief Justice of the Philippine Supreme Court. The 1935 Constitution transferred the authority to appoint the Justices of the Supreme Court to the President of the Philippines. Much of the 1935 Constitution was based on the Constitution of the United States of America. One parallel between the two is the philosophy and process of making appointments to the high court. Appointments are made directly by the President, but with the consent of the Commission on Appointments of the Legislature (by virtue of Article VIII, Sec. 5). II. Why was the JBC created? Thus, the 1987 Constitution, by virtue of Sec. 8 (1), provided for the creation of the JBC. III. Who are the members of the JBC? 5. A representative from the private sector. Members from the government are automatically members of the JBC by virtue of their office. The other four members, however, are appointed by the President and would have to go through the process of being confirmed by the Commission on Appointments. IV. How are candidates nominated? The Constitution provides that a vacancy for the positions of Chief Justice, Associate Justice, Ombudsman, Deputy Ombudsman, and judges of other courts must be filled within 90 days (by virtue of Article VIII, Sec. 4 of the Constitution and Rule 1, Sec. 1 of the Rules of the JBC). As soon as a vacancy opens in the Supreme Court and the Office of the Ombudsman, the position is “ipso facto” open to applications. The JBC convenes and prescribes specific dates for deadlines for the filing of nominations and the form in which applications should be submitted. They then send out a call for applicants or recommendations. It must be noted that since the ratification of the 1987 Constitution, every Chief Justice left office by virtue of retirement at the age of 70 years old. In such cases wherein the retirement of a Chief Justice is anticipated, the JBC convenes months in advance to anticipate the upcoming retirement of Justices and submits its list before the date of retirement. Applicants may file applications themselves or be recommended by other persons. Applications must be filed personally or by registered mail sent to the Secretariat of the Council. A recommended applicant must manifest acceptance either in the recommendation paper itself or in a separate document. His or her acceptance must be filed before the deadline set by the Council. A long list of candidates shall be published in a Philippine newspaper of general circulation and in a newspaper of local circulation in the province or city where the vacancy is located. Copies of the list shall likewise be posted on three conspicuous places in the said area. Copies thereof shall be furnished to major nongovernmental organizations in the city or municipality where such vacancy is located, including the Integrated Bar of the Philippines and its corresponding local chapter. Applicants and recommendees shall be screened based on set qualifications from the 1987 Constitution (a member of the Judiciary must be a citizen of the Philippines, a member of the Philippine Bar, and a person of proven competence, integrity, probity, and independence) as well as by office-specific qualifications set by the rules of the JBC (see sidebar). Those who have been convicted in any criminal case; or in an administrative case, where the penalty imposed is at least a fine of more than P10,000, unless he has been granted judicial clemency. Members of the Judiciary facing administrative complaints under informal preliminary investigation by the Court Administrator. The JBC will prepare a short list of candidates they wish to interview. The Council, en banc or any authorized set of members of the Council, shall interview the candidates to “observe their personality, demeanor, deportment, and physical condition; assess their ability to express themselves, especially in the language of the law in court trials/proceedings and in their decisions or rulings; test their mastery of the law and legal principles; inquire into their philosophies, values, etc. ; determine their probity and independence of mind; and evaluate their readiness and commitment to assume and fulfill the duties and responsibilities of judgeship.” Only the members of the JBC may ask questions during the interview. Although media accessibility will be subject to the rules promulgated by the Council, these interviews shall be conducted in public. For this purpose, the schedule of the interviews shall be published in local- and general-circulation publications. The reports on the personal interviews, however, are declared strictly confidential documents upon submission to the Secretary of Council and shall only be made available to the members of the JBC. A list of candidates that passed the screening process is submitted to the members of the JBC for their final voting and approval. The JBC shall again meet in executive session for the final deliberation. A majority of the members must approve of a candidate in order for his or her name to be included in the final list of nominees that will be submitted to the President. A list of nominees usually consists of five to six names. The President may appoint anyone included in the list of the JBC with no need of confirmation by Congress.